Despite all the government cutbacks and pressure on public services I am pleased that we have been able to hold the 2012 Precept at the same level as the previous year. The Parish council continues to hold its 'Quality Status'. We have to demonstrate that we are representative, in touch with our community, competent and capable of taking on an enhanced role. This enables projects and initiatives which reflects the need and preferences of the villagers to be more easily realised. It also allows the Council to represent you with greater authority. We have had two changes in our membership in the past year. Su Price moved from the village and Neil Liddell resigned after a number of years service, including some time as Chairman. We wish them both well and thank them for their help. Joining us are Jan Redhead and Ivor Machin, and a warm welcome to both. Of course this could all change with the local elections in May. Watch this space. Continual negotiations with the County Council took place regarding minor repairs to weather damaged roads. A number of important problems have been addressed and fixed. Some pavements have been improved and we were able to provide an additional salt bin near the church. We are pleased that good relationships continue with our contact at County and we now get timely responses to issues we raise, many thanks to Cllr Nick Gale for his work on our behalf in this area. We welcome members of the public at our monthly meetings, though we have seen fewer of you recently. It is important that we are kept aware of issues that affect Halford and I would encourage you to participate when you can. The Parish Council has enjoyed working with other organisations from the village. We are supporting the Village Street Party later this year at the time of the Queens Jubilee Wedding. We will be happy to again support the 'Village Tidy Up' in May / June if this is repeated. We are very grateful for the help and assistance we get from our District and County Councillor, Mrs Izzi Seccombe and would like to thank her for the time she spends coming to our meetings. 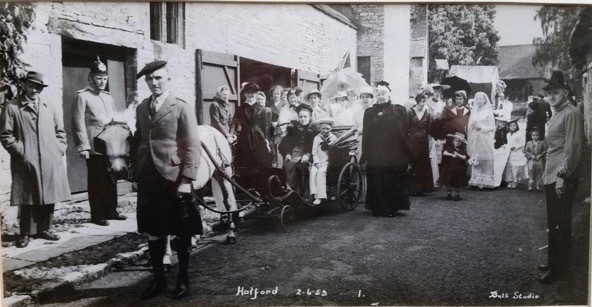 Thanks also to the Halford Bridge Inn who allow our regular monthly meetings to take place there and indeed their support for Halford in general. A pub is essential to the heart of many country villages and we should be grateful for that. It is not an advertisement but we should remember: USE IT OR LOSE IT. The Council would be keen to support a Neighbourhood Watch scheme in the village and are still seeking a co-ordinator. This will not be an onerous of time consuming task and will mainly act as the link contact point. Two people have come forward as supporters for the scheme but neither wishes to be co-ordinator, so come on Halford, let's see someone step forward. Finally I must also thank our Parish Clerk, Karen Parnell. Her knowledge of local government law is most helpful to the lay members of the PC and she endeavours to keep us on the straight and narrow and indeed sometimes actually achieves that!